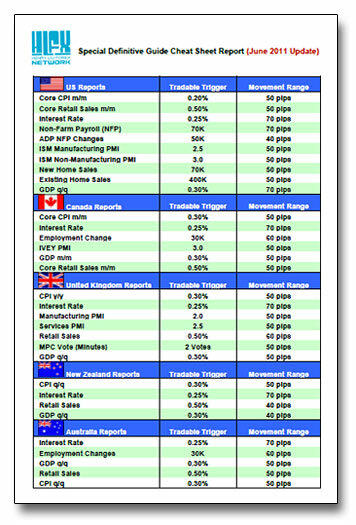 This Forex News Triggersheet report literally took 3 years of trading combining with meticulous record keeping, and finally putting everything together in this one page report. You’ll get my private list of ALL tradable news releases, their tradable deviations, and their expected movement ranges in pips after news… like I said, it’s invaluable. Just by knowing what news releases are tradable, you’ll have the foresight to either take advantage of the news, or avoid the news altogether. Knowing the news will also give you a longer term perspective on the market, so you may also see how news affects the trend, instead of technical analysis or candlestick patterns… In my opinion, news releases are the primary driver of the market, they are the reasons why market trends. In this report, you’ll find the most updated stats, which will help you make the right trading decision during news times. The key to use this report is to compare the actual releases with the forecast. If the difference is equal or greater than the trigger, then you have a reason to take the trade. You can use either the retracement trade method, or the spike trading methods, you can read more about these trading methods in the Education section.